As a United States Marine stationed in Japan, John Dillon, Owner of Outdoor Magic Inc., was exposed to the spectacular gardens, ponds and koi fish, which comprise Japan’s landscape. During his time there, John developed a strong interest in the Japanese pond-building techniques and concepts used to create these magnificent designs. Upon his return to the U.S., John founded Outdoor Magic Inc. – a full-service pond contractor specializing in the design, installation and maintenance of ponds and water gardens with a Japanese flair. 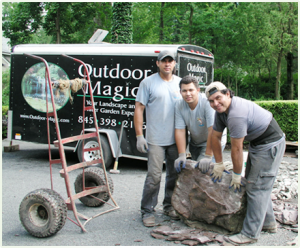 Since 1992, the talented and dedicated team at Outdoor Magic Inc. has installed over 300 water gardens, establishing the company as both a leader and innovator in water garden construction throughout the tri-state (NY, NJ, CT) area. Outdoor Magic’s distinctive design style and high level of quality sets itapart from ‘landscapers that install ponds’. Our company is first and foremost dedicated to water gardens. Simply put, we build the best water gardens in the entire tri-state area. No other company in NY, NJ or CT can equal our experience, quality of work, or dedication to its clients. Outdoor Magic Inc. is not a landscape company that merely installs a pond or two each year; in 2005 alone, we installed over 40 water gardens in the New York (NY) and New Jersey (NJ) areas. With both a pond installation crew and a pond maintenance crew, we are able to handle any and all of your water gardening needs! Additionally, John Dillon has vast expertise in pond filtration, aquatic plants and koi fish health. Should one of your prized koi become ill, we have the experience and knowledge to take care of it. Outdoor Magic Inc. takes great pride in its work, and has made complete client satisfaction its top priority.